The French arms firm Hotchkiss et Cie (Hotchkiss and Co.) was established by American gunsmith Benjamin Hotchkiss in about 1867, and moved into manufacturing automobiles around 1903. During most of the 1950s and 60s, Hotchkiss built Jeeps under license from the Kaiser Corporation, including -- like most overseas manufacturers -- a version of the CJ-3B. A unique part of the Hotchkiss deal, due to the popularity of the many surplus Willys MB's remaining in France after WW2, was licensing of the right to produce genuine MB spare parts, and later a complete (slightly modified) version of the MB for the French army -- the Hotchkiss M201. Only a few things on the early M201 built in 1955 (including tire size 6.50x16, electrical system conforming to the 24-volt NATO specifications) were different from the original MB. 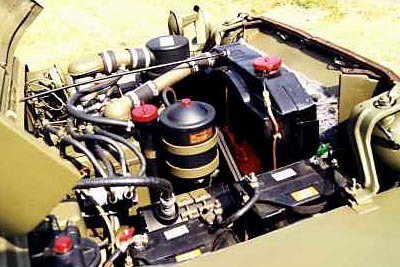 The twin batteries of the 24-volt system are visible in this photo of an M201 engine. Some 27,628 M201's were produced from 1955 to 1967 -- most were sold to the French army. Over the years, the M201 was modified to be more solid and to correct the little defects of the MB -- reinforced radiator, thicker leaf springs, modified parking brake, reinforced cylinder head, new carburetor, new waterpump, and some minor details on the body. This photo shows a late model M201 (December 1961) with metallic spacers on the windshield frame. See also Christophe Guizard's M201 (60K JPEG), with windshield opening for mounting a recoilless rifle. In June 1952, Hotchkiss had signed the first contract to build and sell spare parts for the MB, and to build a version of the CJ-3A. Negotiations took so long (nearly a year) that Kaiser and Hotchkiss decided the CJ-3A would be replaced by the 3B, which had just entered production in the U.S. Seventy CJ-3Bs were built in 1954 in the factory at Saint Denis near Paris, with all the parts coming from the U.S. 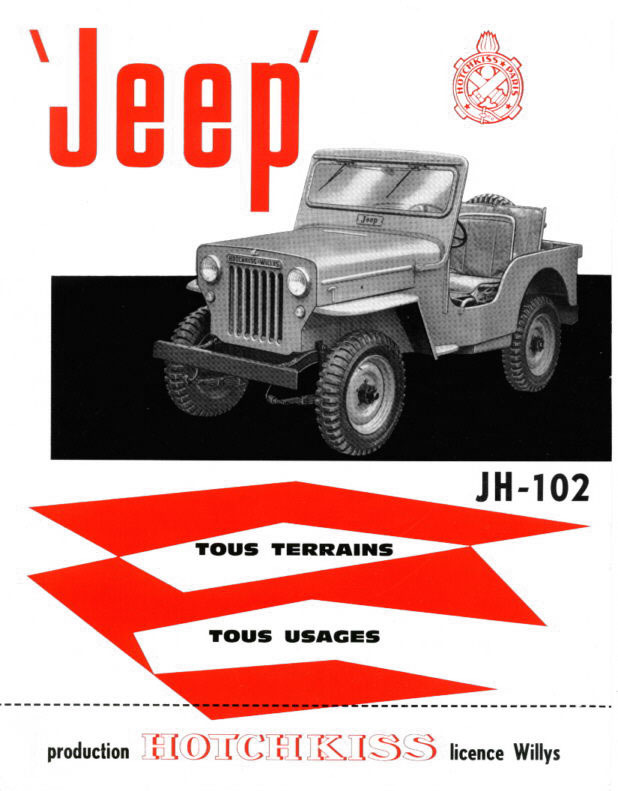 The first true year of production of the 3B in France was 1955, and the Jeep was called the JH-101. 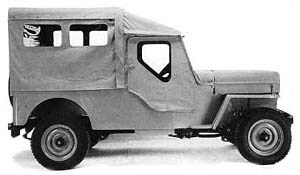 Body (and fenders, hood and grille), frame and axles were identical to the CJ-3B. This photo was taken by Laurent Jakob in 1999 at a Jeep jamboree in southern France. Notice the "Hotchkiss-Willys" label above the grille. See also a unique Hotchkiss JH101 Brochure. Because Hotchkiss was already building the MB in the same plant, they decided to put the Go-Devil engine and the MB's gearbox in the JH-101. The F-Head engine and Warner gearbox were an option, and in fact most customers asked for the F-head when ordering. Many Hotchkiss Jeeps were sold to government agencies and fire brigades (see CJ-3B Fire Engines Around the World). Civilian customers were few because the selling price was high and because there were a lot of second-hand Willys MB/Ford GPW's on the market at low prices. After the production of 3496 units, the JH-101 was replaced in 1960 by the JH-102, which had a few changes (bellhousing, motor mounts, electrical system). To spot a JH-102, look for the smaller headlights. This military JH-102 with hot-weather radiator overflow cannister was photographed by J-F Lavie at an owner's club event in 2005. See also a right side view (60K JPEG). An interior photo of the miltary JH-102 shows a first aid kit marked "For emergency use only" and a fire extinguisher on the passenger side. The JH-102 dashboard features separate speedometer and gauges rather than the Willys/Kaiser instrument cluster. The model ID plate (40K JPEG) mounted on the windshield frame misspells the company name as "Hotckiss". The canvas top (50K JPEG) has a framework similar to the early Willys soft top. Starting in 1962 the JH-102D was offered, with a diesel engine -- the 55 HP Indenor 85XPD-4 -- which didn't offer enough power and didn't have great success. Hotchkiss built 1041 JH-102's and 93 JH-102D's before production stopped in 1966. 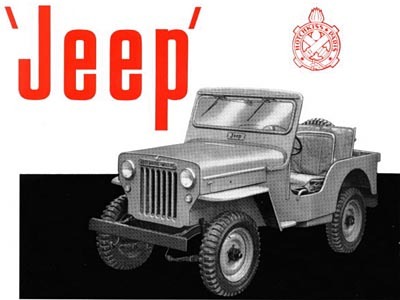 See a matchbook (50K JPEG) found by Gary Keating, that was part of the marketing effort for the diesel Jeep. Meanwhile, the HWL, a stretched version of the JH-102, was conceived by Hotchkiss to take the place of the CJ-6 on the French market. The CJ-6 was considered too expensive to build (new tooling was necessary), or to import into France. Production of the 100-inch wheelbase HWL started in 1963, with gasoline and diesel engines available. The diesel version was called HWLD. A high, long soft top, and a short half-cab soft top, were available, as well as two hard-tops (one in steel, the other in fiberglass). 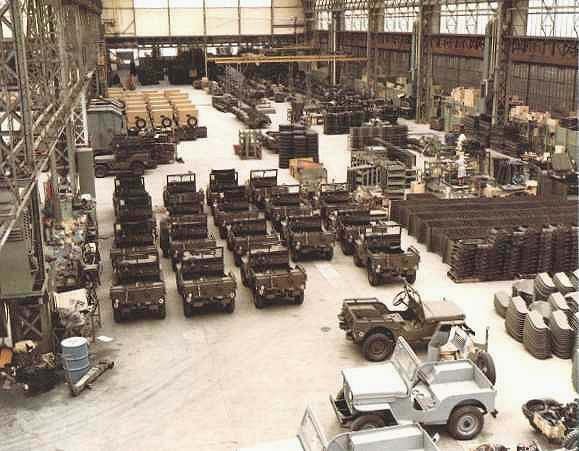 Only 730 HWL's and 43 HWLD's were built from 1963 to 1966, the last year of production for "3B look-alike" Jeeps in France. This photo was taken at a farm tractor show in Caussade, France in October 2001, by Jean-Louis Martin. He says the HWL was offered for sale for 25,000 francs (about US$3500). See also a right side rear view (70K JPEG). Jean-Louis has also identified this photo of a parade of HWL's -- he found the answer in Histoires de tout terrain (50K JPEG), a 1991 compilation of magazine articles by Jean-Gabriel Jeudy. The picture was taken by Daniel Tard (historian and former employee of Hotchkiss) in Madagascar, a big customer for Hotchkiss in the fifties. 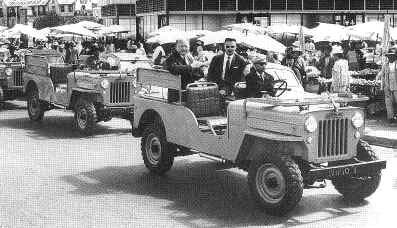 The man in the Jeep is Mr. Saunders, commercial director of Hotchkiss. Hotchkiss got out of the automotive business in 1970, and all tooling and machinery to build the JH and the HWL were sold to VIASA in Spain. See other French Jeeps on CJ3B.info: The Cournil Jeep Tractor and Hotchkiss Fire Jeeps. See also The Blue Caps -- Hotchkiss and Delahaye Jeeps with the French army in Algeria, 1957. 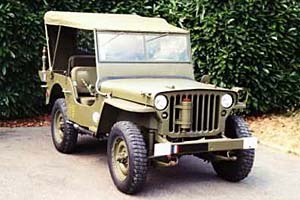 Elsewhere on the web, see the Jeep Club de France and Andy's French Military Jeep Site. Jean-Louis Martin's Hotchkiss M201 website includes original photos and literature on all the Hotchkiss models. See more Jeeps Around the World on CJ3B.info.